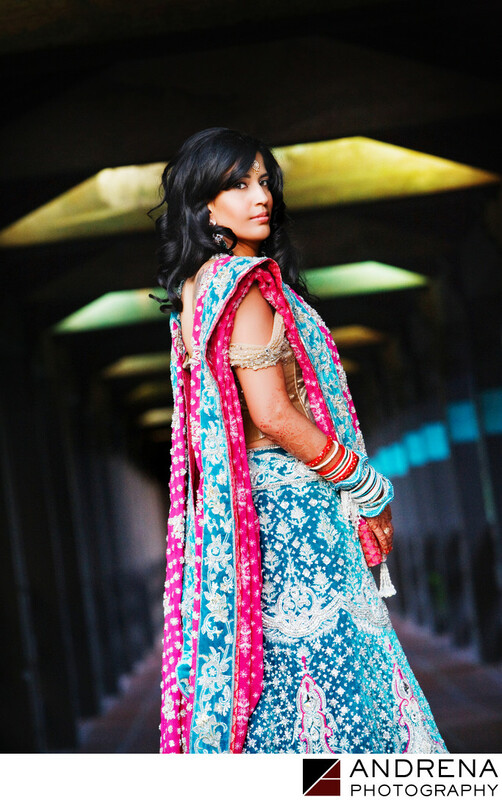 The Langham Hotel in Pasadena, California, is a beautiful location for Indian weddings of all shapes and sizes. I was thus delighted when my bride told me that the reception for her six-day wedding would be at the Langham. I photographed this portrait on the bridge just above the pool area, using a shallow depth of field to blur signage and instead create pops of color. The bride wore a custom Manish Malhotra lengha which was a stunning creation made of velvet and other luxury materials. Manish Malhotra is a couture designer in India, and routinely dresses Bollywood stars. The reception room was done in oranges, purples and fuchsias, and the bride and groom gave away champagne bottles for their guests to take home. Interestingly, the bride and groom grew up just a few doors down the street from one another. Indian wedding and reception photographed at the Langham in Pasadena, California.